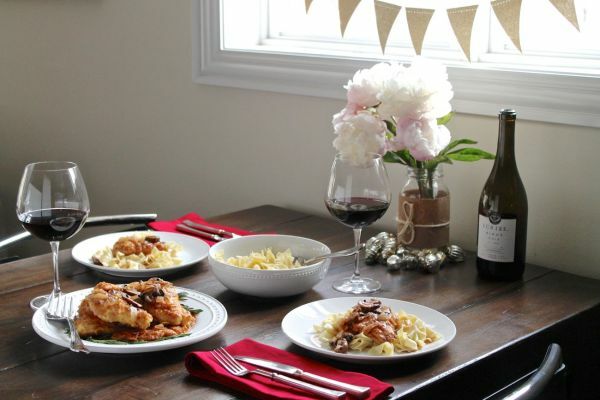 My mother’s recipe for Classic Chicken Marsala has been a staple at special occasions and family gatherings for years! 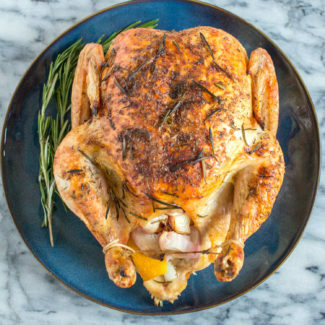 The best thing is that is tastes even better when it is made a day early, it is the perfect make-ahead holiday meal! 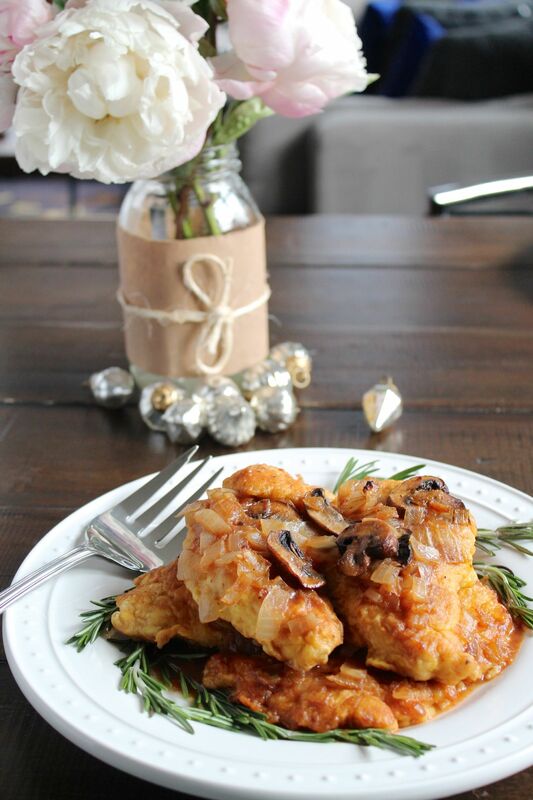 My family is always switching up what we serve for Christmas dinner, but one of my favorites is this Classic Chicken Marsala. 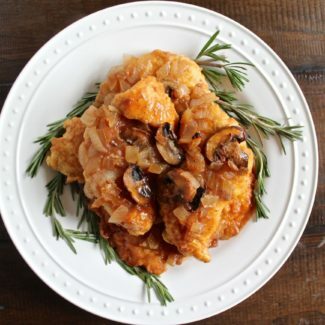 The great thing about this recipe is that it tastes best when it is made a day or two ahead of time since the chicken gets even more tender as it sits in the marsala sauce. 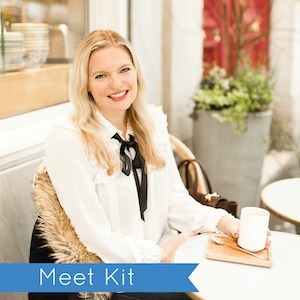 Plus, by preparing Christmas dinner ahead of time, you can spend less time in the kitchen and even more time with your family on Christmas day. It’s a win-win. 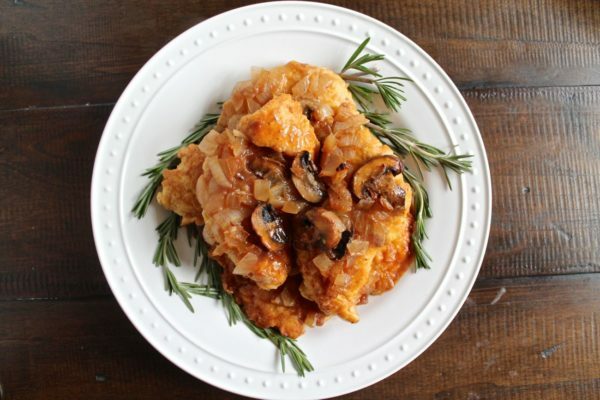 This recipe is a very traditional recipe for Chicken Marsala based off of the recipe that my mother gave me (she’s Italian and she knows her stuff). 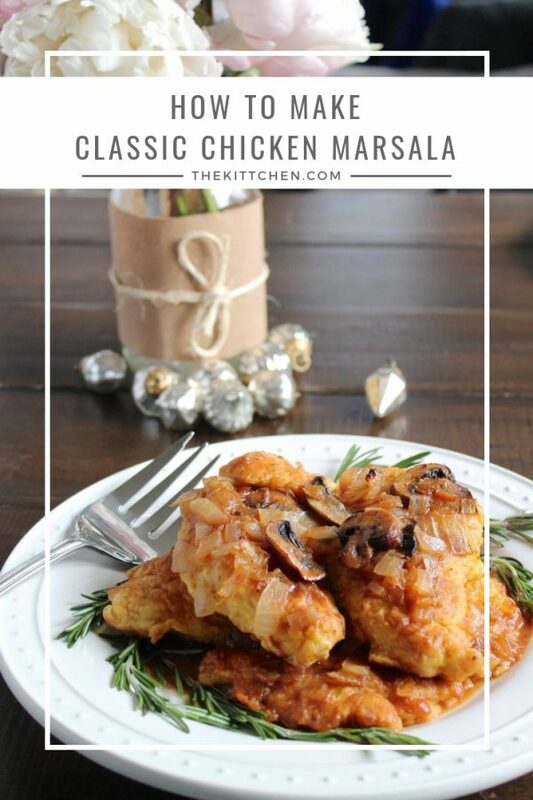 I love how the flour breading on the chicken absorbs the marsala flavor. The mushrooms add extra richness and depth of flavor while the onions give just a hint of texture and sweetness. This chicken can be served with rice pilaf, mashed potatoes, or pasta. I like to serve it on a bed of egg noodles with the sauce generously spooned over the top. I like to add so many mushrooms to the sauce that another vegetable is not necessary. This is a sure-to-please recipe that feeds a crowd, and it only takes basic kitchen skills to prepare. 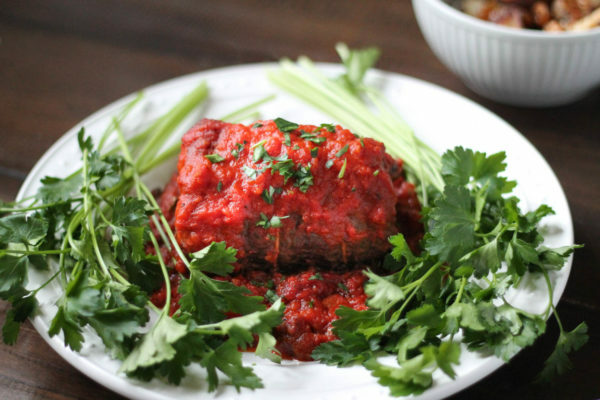 It is a meal that my family has enjoyed on many holidays, and I think your family will love it too. 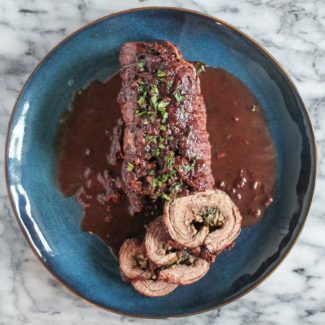 Braciole is flank steak rolled up with cheese and herbs and cooked in tomato sauce. 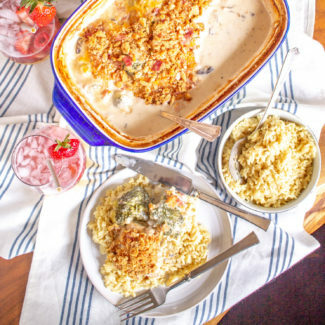 It’s one of the recipes that can feed a crowd without much extra effort. 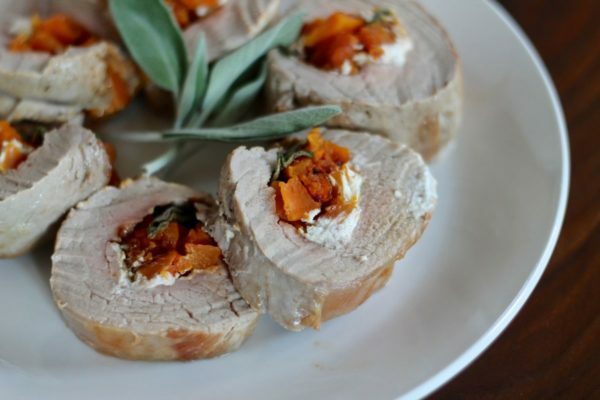 I made Pork Tenderloin Stuffed with Butternut Squash, Goat Cheese and Sage for Christmas and it even impressed my mother in law. 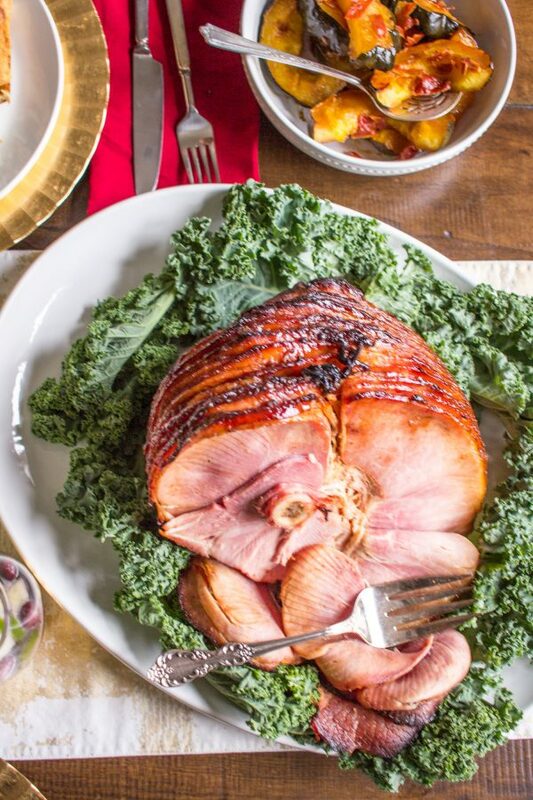 Honey Maple Glazed Ham is an easy recipe that will easily feed a crowd, it’s great to serve at holiday parties or as a main dish at a holiday meal. 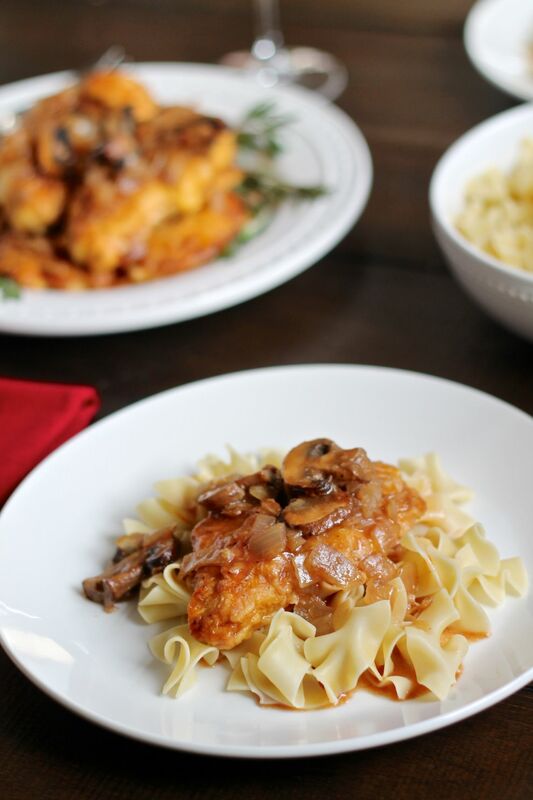 My mother's recipe for Classic Chicken Marsala has been a staple at special occasions and family gatherings for years! 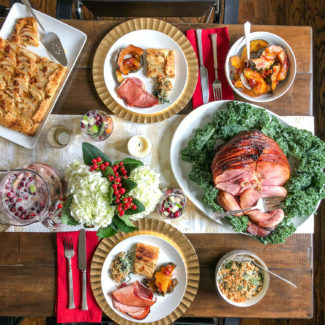 The best thing is that is tastes even better when it is made a day early, it is the perfect make-ahead holiday meal! Dice the onion. Then heat 1 tablespoon of olive oil in a large skillet over medium heat. Once the olive oil is hot, add the onions and sauté until it is soft and slightly golden. Next stir in the mushrooms and garlic, season with salt and pepper, and sauté for a minute. Then add in 1/2 cup Marsala Wine. Sauté until the wine has been absorbed, then pour into a bowl and set aside. Slice the chicken breasts in half from top to bottom and use a kitchen mallet to pound out the chicken breasts until they are thin and have increased in size by about 50%. Next prepare the flour and egg mixture to dredge the chicken. 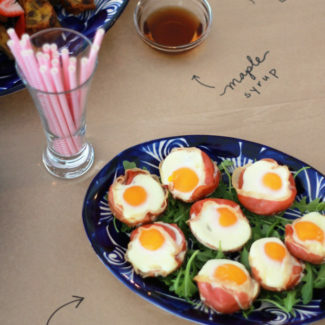 In a bowl, beat the eggs and lemon juice together. In a second bowl, season 1 cup of flour with salt and pepper. Heat enough olive oil to coat the bottom of a skillet over medium heat. Then coat the chicken in the seasoned flour, then the egg, and then in the flour again. Brown each side of the chicken in batches by placing it in the skillet, making sure you don't overcrowd the pan. Add more olive oil to the pan as necessary. Layer the browned chicken in a greased casserole dish, and continue cooking the chicken in batches. Once all of the chicken has browned, pour all of the remaining wine in the same skillet you used to cook the chicken. 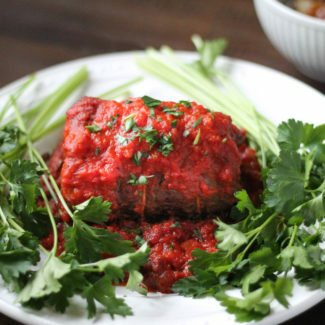 Whisk in the tomato paste and 1 tablespoon flour. Scrape any browned bits of chicken off the bottom of the skillet and stir until the sauce boils. Add the onions and mushrooms and then let boil for another 3 minutes. Pour the sauce over the chicken in the casserole dish, cover, and place in the oven to bake for 1 hour. You can either serve the chicken marsala right away, or wait 1-2 days and reheat the chicken in an oven set to 250 degrees. Cover the chicken marsala when reheating.